A new study done by the University of Minnesota Academic Health Center suggests that rats feel regret after making poor decisions in the same way that humans do. The small rodents were given a test, called ‘”restaurant row,” where they had the option of choosing several different rooms, each one with a different treat in it. When a rat chose a room with a less desirable treat, it looked back at the other rooms. The researchers believe that this is because they felt regret about choosing wrongly. The researchers also used imaging to study the brain activity of the rats. They noticed that when the rats made a mistake, the orbitofrontal cortex of the brain lit up. That is the area of the brain that is believed to control emotions like regret in humans. “Regret is something we think of as very human and very cognitive. We’re seeing that the rats are much more cognitive than we thought,” said A. David Redish, co-leader of the study. 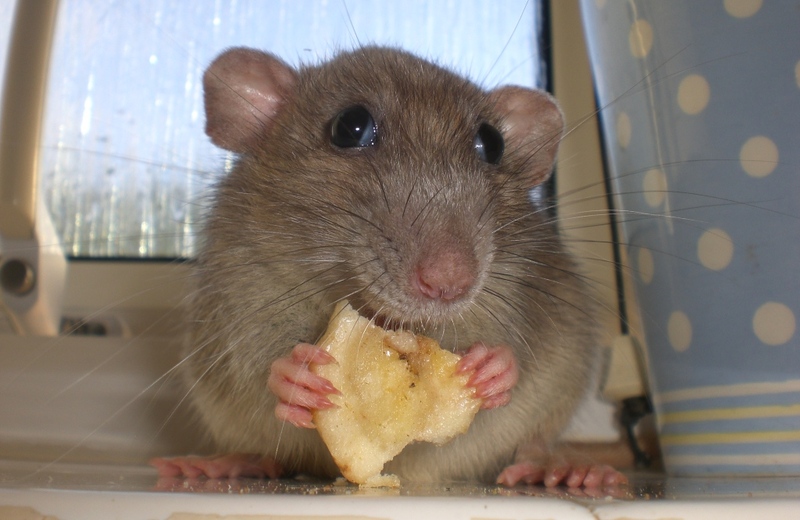 The rats also ate the less desirable food very quickly, while waiting a long time for a chance to eat the better food. Prior to this study, it was thought that only humans could feel emotions like regret. If this study is confirmed by other findings, it could be a breakthrough for animal cognition research. “Regret is the recognition that you made a mistake, that if you had done something else, you would have been better off. The difficult part of this study was separating regret from disappointment, which is when things aren’t as good as you would have hoped. The key to distinguishing between the two was letting the rats choose what to do,” Redish explained. Although they are not sure, the researchers believe that other animals may also feel regret or disappointment. More tests will have to be done to figure that out, however. All animals have feelings, Im sick of articles like this. They make it sound like this is new information. Regret for picking the wrong treat is a whole lot different than regret for killing one of their own or similar. I don’t know if I’d call it regret when it’s centered around an animal’s selfish need to eat a better treat than what they have. I don’t know if I agree with that. There are actually people who have regrets over their actions toward others, believe it or not in this day and age, And to me, it’s at the very least an ability to show regret on a deeper and less selfish level, which differs from the kind of regret we get when we go to a bad restaurant. In nature, it’s generally better for survival to eliminate rivals and seek the best source of nutrition. Animal bodies determine nutrition through taste. So a rat killing another rat is good for survival, but choosing a lesser treat is not, thus regret. I knew B. Madoff and his ilk felt regrets AFTER being caught….Jury is still out on WMD pushers, though…. “Regret is the recognition that you made a mistake, that if you had done something else, you would have been better off” Wonder who the rats would vote for if they had to look back on the last presidential election? It certainly wouldn’t be for any of the loonies the GOP has to offer. Do you know why scientists stopped using rats for experiments and started using lawyers instead? 1. You don’t get as emotionally attached to a lawyer. 2. There are some things that a rat just won’t do. the part i like is the headline says “may”. too many stories make news by eliminating that from what the scientists actually say. too often, if the scientist says ‘may’, the reporter writes ‘does’. i commend this writer.